Noteworthy is the upcoming world première of a new work by Hossein Hadisi for voices, percussion and dance. 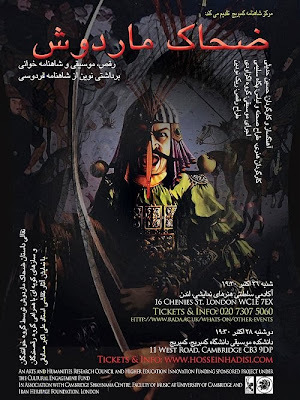 Zahhák: the Dragon King of Persia celebrates the Persian minstrels' art of Naqqáli by re-enacting the ancient myth of Zahhák from the Persian 'Book of Kings'. Hossein Hadisi studied composition with Michael Finnissy and his works include Places I'd Take Michael Finnissy To Visit If He Was Ever Going To Come To Iran for piano. Currently a research associate at Cambridge University studying the traditional Persian improvisation school of Avaz, Hadisi's work spans rock and contemporary music and Bang the Bore XI: Psychobabble based on the Muslim rite of prayer can be sampled here. Zahhák: the Dragon King of Persia is performed by leading contemporary music ensemble Exaudi with dancers from London Contemporary Dance School and the production features paintings by Iranian surrealist master Ali Akbar Sadeghi. Performances are at the RADA Studio Theatre, London WC1 on Oct 26 and West Road Concert Hall, Cambridge on Oct 28. Exaudi's co-founder and director James Weeks can be heard talking to me about the music of Elisabeth Lutyens in An Overgrown Path podcast while more of Hossein Hadisi's music can be sampled here. There is a salutary tale of Western classical music in pre-revolution Iran in More maestros myths and madness. There is interest in Western classical music in post-Revolution Iran, too. The Iranian journal Music Report devoted an entire issue to John Cage last year (yet another birthday tribute). I was honored to contribute to that, and blogged about it here. Thanks for informing us about this. In a fitting coincidence, a friend and I who read various classical Persian texts together, in Persian, each day, just got off the phone after working further through the story of Zahak, which occurs near the beginning of Ferdowsi's Shahnameh. My path must now wind towards Hadisi and Finnissy.